We’ll be encouraging use of Twitter at IWMW 2009 in order to enrich discussions of the plenary talks and to help delegates to get to know each other. In addition Kirsty McGill will act as the official live blogger, keeping a record of the plenary talks. We feel this may be particularly useful for the remote audience watching the talks on the video streaming. The hashtag for the event is “#iwmw2009”. Twitter posts with this tag will be integrated with the official IWMWlive blog posts (which will be published by the iwmwlive Twitter account). In addition the IWMW Twitter account will be used for admin purposes – so if we find a set of keys, as happened last year, we are likely to announce this on the IWMW Twitter channel. If you wish to refer to a specific plenary talk or workshop session, we have defined a hashtag for each of the plenary talks (#p1 to #p9) and workshop session (#a1-#a9, #b1-#b4 and #c1 to #c5). These are listed on the list of plenary talks and workshop sessions. We appreciate that this may appear over-complicated, but note that use of these hashtags are optional; they have been provided as a means of disambiguating tweets if this is felt to be useful. There is one plenary talk in which the Twitter channel will form a essential component of the talk. James Currall, in his talk on “What is the Web?” wishes to include a live display of tweets related to his talk. In order to ensure that this live display isn’t cluttered up with other comments, the tag “#iwmw-p4” should be used if you want your tweets to appear on the display. 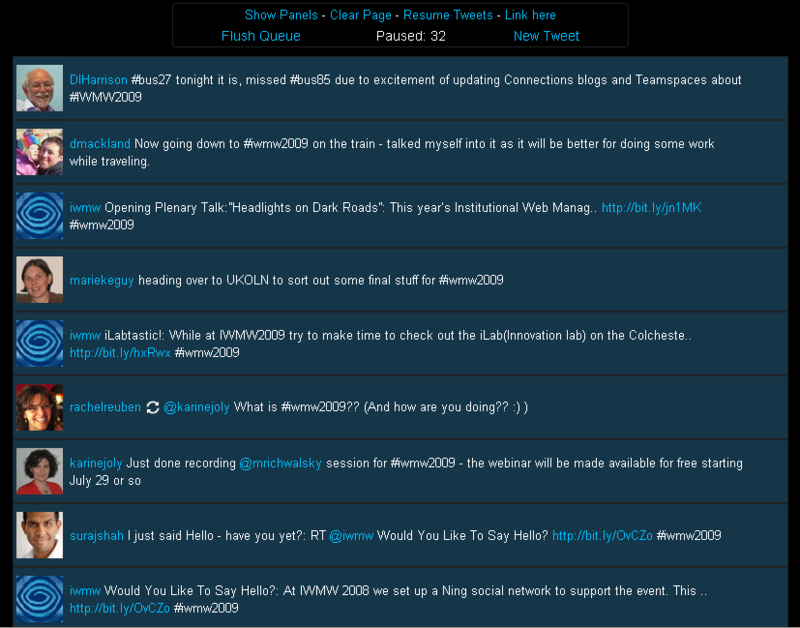 Note if you have space you could also use the “#iwmw2009” tag to ensure your tweet is included with other event tweets. We intend to use the Twitterfall service to display tweets containing this tag. An example of this service is illustrated. Also note that we intend to archive the various posts containing the “#iwmw2009” tag as well as the tweets from the iwmw and iwmwlive Twitter accounts. We are using a number of services to do this, including the backupmytweets service which stores the tweets in HTML, XML and JSON formats. We will be happy to make this data freely available if any developers would like to use this data in any creative way! I’ll be interested to see what take-up is for your #complexhashtagsuggestion. Personally (as you know!) I think it’s an error of complexity over usability. But I guess we’ll see by watching what emerges. May be that the audience is geeky enough to be able to cope.